The Book of Ruth (Hebrew: מגילת רות, Megilat Rut, "the Scroll of Ruth") is one of the books of the Hebrew Bible. Classified as one of the "Writings" (Ketuvim), the book tells the story of a Moabite woman, Ruth, who faithfully follows her mother-in-law back to the territory of the Tribe of Judah after her husband's death. She adopts the Israelite tradition of marrying her deceased husband's kinsman and eventually becomes the foremother of King David. Ruth is one of the shortest books in both Jewish and Christian scripture, consisting of only four chapters. Some traditions hold it to have been written by the prophet Samuel (eleventh century B.C.E.). Modern scholars generally fall into one of two camps: that it was originally part of the Book of Judges and written shortly after the time of King David in the tenth century B.C.E., or that it was composed in the post-exilic period of Jewish history around 500 B.C.E. It is often cited as a counterpoint to other biblical books that oppose Israelite intermarriage with non-Hebrews. Ruth clings to her mother-in-law Naomi while her sister-in-law Orpah turns away William Blake, 1795. Ruth the Moabitess, foremother of King David. and your God my God." (Ruth 1:16). Naomi and Ruth return to Bethlehem during the time of the barley harvest. In order to provide food for the two women, Ruth gleans in the fields of Boaz, Naomi’s kinsman. Boaz notices her, and, impressed by her loyalty to Naomi, offers her protection, even though she is a Moabitess and considered less than a slave. Boaz insures that Ruth prospers in her gleaning, and Naomi is overjoyed at his kindness. Boaz awkes to discover Ruth lying at his feet. Luckily, Boaz is a man of noble character. He accepts Ruth's gesture as an honorable one, but informs her that there is a closer kinsman who has the first right to act as her redeemer. It is necessary for the closer kinsman to renounce his right before Boaz can proceed in the matter. Accordingly, Boaz meets with the closer kinsman and informs him of his right to redeem the estate of Elimelech and to marry Ruth. The kinsman declines, possibly because Ruth is a Moabitess, but explicitly because any child born from the union would be considered as Elimelech's rather than his own. He thus waives his right both to purchase Elimelech’s property from Naomi and to marry Ruth. The town elders, members of Boaz' own tribe of Judah, witness his declaration, affirming: "Through the offspring the Lord gives you by this young woman, may your family be like that of Perez, whom Tamar bore to Judah." By invoking Tamar, the elders recall a similar Levirite marriage in which Tamar, the foremother of the tribe of Judah, had risked her life in order to preserve her father-in-law's lineage. Boaz marries Ruth and they have a son, Obed. He is considered technically to be “born to Naomi,” (Ruth 4:17) indicating that Elimelech’s line is continued and Naomi is blessed by Obed’s birth. The genealogy that concludes the book of Ruth climaxes with the wonderful disclosure that Ruth of Moab is the great-grandmother of King David. 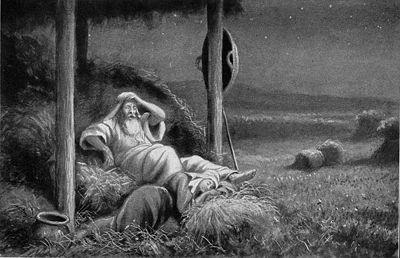 Many of the Old Testament books do not identify their author, and the Book of Ruth is no exception. The Talmud, however, refers to Samuel as the author, and Christian traditions also affirm Samuel's authorship. However, modern scholars generally do not accept this tradition. For one thing, Samuel died before David became king, and the genealogy in Ruth 4:18-22 implied that David's kingship is already well known. Also the reference in Ruth 1:1 to the “days when the judges ruled…” indicates that the era had ended and that the audience was somewhat removed from the time. 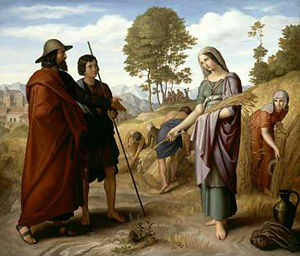 Julius Schnorr von Carolsfeld: Ruth in Boaz's Field, 1828. Although most scholars thus reject Samuel as the book's author, the dating of Ruth is a subject of much debate. Many believe that the Book of Ruth was originally part of the Book of Judges, but was later separated from that book and made independent. The opening verses explicitly place the Book of Ruth in the time of the judges and it concludes with the Davidic lineage. Therefore, one would suppose that the author wrote the story after the time of King David. One possibility is sometime in the tenth century B.C.E., shortly after David's reign. Others are convinced that the book originates from a much later date of approximately 500 B.C.E.. 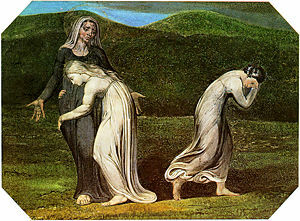 They argue that the message of Ruth is to show, dramatized, the acceptance of Israelites marrying converts to Judaism. This suggests that the book was written during the early days of the post-exilic period. The great post-exilic priest Ezra condemned intermarriages and ordered the Israelites to abandon their non-Hebrew wives. Indeed, Ezra (10:2ff) and Nehemiah (13:23ff) take the direct opposite view to that of the Book of Ruth on the question of marrying foreign women. According to this theory, Ruth was written in response to Ezra's reform and in defense of a marriage to a foreigner as long as she respects Jewish tradition. Acceptance of such marriages is further enforced by making the connection to the Davidic line, as David is commonly seen as the greatest king of the Hebrew people. In addition, scholars point to the language style of the book as being more in line with the later date. Some scholars suggest that the writer of Ruth is a woman. Two observations point in the direction of a female author. First, the story centers on the life journey of two women in desperate straits in a male-dominated society, and appears to be from the viewpoint of a woman. Second, Naomi and Ruth’s ingenuity and assertiveness propels the story line. The book of Ruth has a special significance to Jews. Ruth is honored among several women in Jewish tradition as a convert to Judaism who understood Jewish principles and took them to heart. This book is also dear to the hearts of Jews who are Jews-by-choice. In traditional settings, the Book of Ruth is read on the second day of Shavuot, the spring harvest festival. One rabbinical tradition holds that while Ruth became the foremother of King David, her sister-in-law Orpha led a degraded life after parting from Naomi and eventually became the mother of Israel's enemy, the giant Goliath. For Christians the book has additional significance. The connection between Ruth and David is very important because Jesus Christ was born of the Virgin Mary, whose husband Joseph was of the lineage of David, thus making Ruth a fore-mother of Jesus Christ (Matthew 1:5). Ruth's famous words, "For wherever you go, I will go ...," are used in Catholic and some Protestant marriage services, underscoring the virtue of loyalty. Translation with Rashi's commentary – Chabad.org. 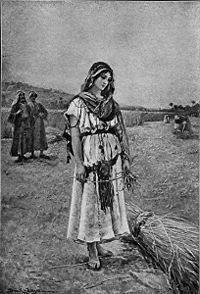 Various Translations of the Book of Ruth – Biblegateway.com. Book of Ruth – Catholic Encyclopedia. Ruth, Book of – Jewish Encyclopedia. History of "Ruth, Book of"
This page was last modified on 22 July 2015, at 16:25.